This article is a short summary of Super Mario 64 DS. 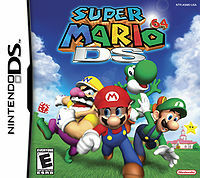 Super Mario 64 DS is a 3D platforming game and remake of the Nintendo 64 title Super Mario 64, released as a launch title for the Nintendo DS in 2004. In addition to enhanced graphics, The Nintendo DS port also features new playable characters in addition to new content. Super Mario 64 DS features three methods of control: Standard Mode which uses the D-pad to move and the buttons for actions, Touch Mode which uses the stylus and touch screen for movement, and Dual-Hand Mode which uses the stylus to move and either the D-pad (for left-handed players) or buttons (for right-handed players) to perform actions. The game features four additional playable characters, who must be unlocked by defeating certain bosses. Each character has different stats and abilities from each other: While Mario has all-around stats, Yoshi fights by eating enemies and turning them into eggs to throw, Luigi jumps higher and runs faster but has less traction, and Wario is stronger but slower and cannot jump as high. Each character also has a unique power that can be used by collecting a Power Flower (in place of the caps of the Nintendo 64 version). A set of extra minigames can be unlocked catching rabbits that are scattered around the castle, color-coded depending on the currently active character. These minigames can be played either in the game in the Rec Room, or from the main menu. The game also features a VS Mode, in which up to four players can play locally over Download Play and compete in four stages as a different-colored Yoshi to collect the most Power Stars and coins. EU/AUS: December 25, 2015 An emulated port of the original game, with added Virtual Console emulator features. This page was last edited on 30 October 2016, at 00:08.